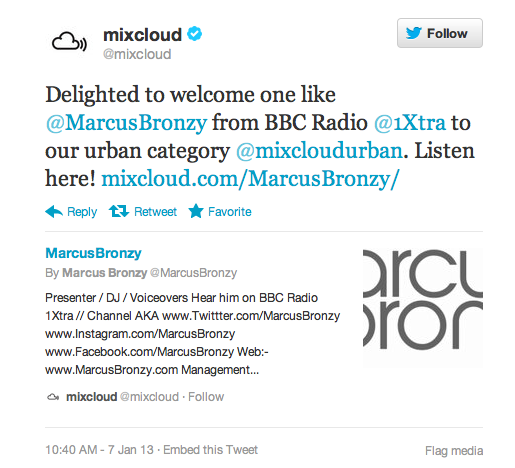 Marcus Bronzy has been selected to feature on one of the largest internet streaming sources Mixcloud.com. A clearly happy Marcus said “I’m glad to see my personal recording and mixes as well as work on National Radio has been recognised and given this extra platform to share with the people” . So make sure you check out his Mixcloud account by clicking here! When not in the mix Marcus also regularly presents a varied number of shows on BBC Radio 1Xtra. Marcus will also be blogging about this! BBC Radio 1Xtra – Marcus Radio Marathon! BBC Radio 1Xtra – Bronzy’s Breakfast Banter!